Roosevelt Way, looking north from Ravenna Boulevard. At the Wednesday meeting of Seattle’s Bicycle Advisory Board, staff from the city’s department of transportation (SDOT) announced they will indeed extend a protected bike lane (PBL) another 20 blocks as part of an arterial repaving project on Roosevelt Way NE this summer. Prompted by neighborhood residents, SDOT agreed to change their original plans and replace a lane of parking with a PBL between NE 45th Street and the University Bridge, one of only two water crossings towards downtown. Extending north to NE 65th Street, the terminus of the paving project, is a tremendous step for increasing safety on one of the city’s key commercial corridors. The city’s Bicycle Master Plan shows the PBL extended even further north, but this new 1.4 mile stretch (not including the bridge) alone will be a significant addition to the city’s network. Roosevelt is commonly cited as one of the city’s most dangerous routes for bicyclists. 65th Street is the heart of the Roosevelt neighborhood, and near a high school and a future light rail station. The crossing at Ravenna Boulevard is significant, as that street’s bike lanes will be upgraded with some form of separation this year. And at NE 47th Street, a greenway is planned sometime in the future with a bridge crossing over Interstate 5. As mentioned at an open house and in a previous post, SDOT was able to come up with the anticipated extra funding. The bike component of the $9.1 million project is estimated to cost $590,000, only 6 percent of the total. But that number is still fairly large when one considers the cost of Seattle’s standard paint and plastic posts for PBLs; the Green Lane Project estimates it at only $15,000 to $30,000 per mile. Concrete curbs, an option that provides an actual barrier against vehicles, are $25,000 to $80,000 per mile. The cost estimate probably includes the 11 feet of new pavement that the PBL will be on, along with curb adjustments at the narrow University Bridge entry. The project will also increase transit reliability by creating in-lane bus stops with “bus bulbs” (sidewalk extensions) that are already planned. The PBL will now run between the sidewalk and transit islands, like on Dexter Avenue (and in my proposal for 15th Avenue). The islands provide extra room for waiting passengers. And instead of merging in and out of traffic, buses will now stop and go with ease. The primary routes in this corridor are the 66 and 67, which run from Northgate to Downtown and the University District, respectively. SDOT is planning to conduct a high-frequency transit study for the corridor, considering that light rail will serve the same areas by 2021. Options may include bus rapid transit or a rapid streetcar. The PBL will be a one-way version of this recent addition to NE 40th Street. The need for current bus reliability is why SDOT is not considering the option of turning one of Roosevelt’s drive lanes into an off-peak parking lane, meaning two drive lanes will always be open. A question-and-answer (PDF) document from SDOT explains that the removal of 122 on-street parking spaces and 13 loading zones on the west side of the street will be negated by relocating load zones to side streets and the east side of the street. SDOT reports that south of 45th Street, at least, the parking being removed was only 33 percent utilized. While on-street parking is beneficial for numerous reasons, it’s often the lowest priority for valuable right-of-way. The arrangement of the roadway, pictured above, is slightly different than the last update. The east parking lane will be widened to eight feet and the bike lane buffer will only four feet, which is still plenty. The bike lane will probably narrow to five feet at bus stops to allow transit islands to be six feet wide, the minimum sidewalk width. Other components of the Roosevelt repaving project will include the installation of curb ramps and curb bulbs at intersections, small changes that dramatically improve walkability. As the city’s bike network is expanded over the coming year’s, there will undoubtedly be opposition. It’s noteworthy that protected bike lanes also improve safety for all road users. Cyclists, of course, benefit from vehicle separation and having a wide dedicated lane that makes their movements predictable. Drivers instinctively slow down whenever there’s something other than pavement around them, whether that’s parked cars, trees, or bollards. And if a PBL removes a lane, it narrows the roadway and shortens the distance that pedestrians must cross. 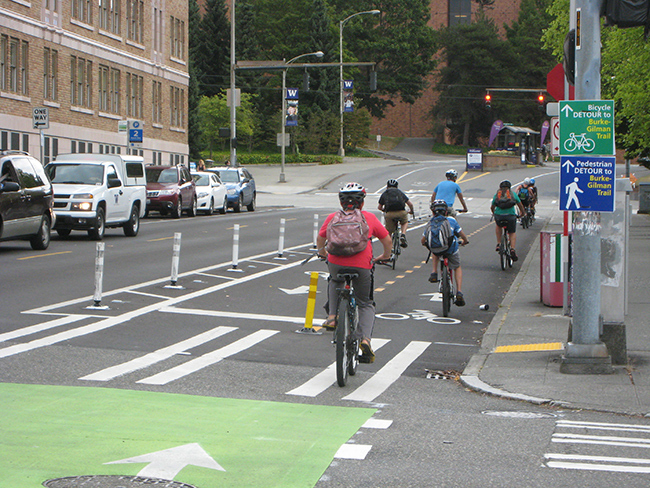 Seattle continues to be a leader in bicycle and general street safety. Readers who reside here or elsewhere can point to the unlikely success of this project as an example of how streets can be redesigned for all users at the urging of knowledgeable residents. As more urbanites ditch their cars, creating practical multi-modal streets will ensure that neighborhoods and cities thrive and work for everyone. This entry was posted in Biking, Buses, Cars, Government, Parking, Transportation and tagged 45th Street, 65th Street, bus bulbs, cost, department of transportation, extension, funding, neighborhood, PBL, protected bike lane, Ravenna, Roosevelt, Roosevelt Way NE, SDOT, Seattle, sidewalk, transit, transit islands, U-District, University Bridge, university district, University Greenways. Bookmark the permalink.